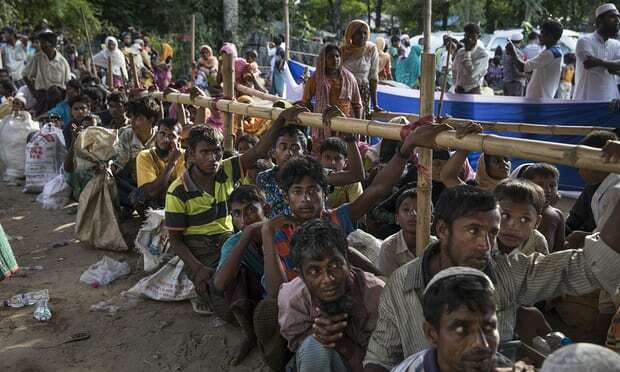 The UN commissioned and then “suppressed” a report that criticised its strategy in Myanmar and warned it was ill-prepared to deal with the impending Rohingya crisis, sources have told the Guardian. The review, written by a consultant and submitted in May, offered a highly critical analysis of the UN’s approach and said there should be “no silence on human rights”. The report, a copy of which has been obtained by the Guardian, accurately predicted a “serious deterioration” in the six months following its submission and urged the UN to undertake “serious contingency planning”. “It is recommended that, as a matter of urgency, UN headquarters identifies ways to improve overall coherence in the UN’s system approach,” wrote independent analyst Richard Horsey, the report’s author. Security forces would be “heavy-handed and indiscriminate” in dealing with the Rohingya, said Horsey – a prediction that rang true when Rohingya militants attacked dozens of outposts on 25 August, prompting a massive military crackdown. In little more than a month, more than half a million Rohingya have fled over the border to Bangladesh amid allegations of massacres by Myanmar’s armed forces and Rohingya insurgents. On Thursday Bangladesh announced that it would build one of the world’s biggest refugee camps to house all those who have sought asylum. The UN report, entitled The Role of the United Nations in Rakhine state, was commissioned by Renata Lok-Dessallien, the UN resident coordinator and the organisation’s most senior figure in Myanmar. It made 16 recommendations. Horsey outlined the need for new staff positions and “frank” discussions with government, and called for the report to be widely distributed among aid agencies. The UN was urged to ensure that the human rights up front initiative, a strategy introduced by former secretary general Ban Ki-moon to prevent mass atrocities, was fully implemented. Horsey said the initiative should “be at the core of how the UN operates”, adding that there should be “no silence on human rights and protection concerns”. However, sources within the UN and humanitarian community claimed the recommendations were ignored and the report was suppressed. A source close to events, who asked not to be named, said the paper was “spiked” and not circulated among UN and aid agencies “because Renata [Lok-Dessallien] didn’t like the analysis”. “It was given to Renata and she didn’t distribute it further because she wasn’t happy with it,” said another well-placed source. The 28-page document said its author would be expected to provide feedback to the UN’s humanitarian country team, a group consisting of UN agencies such as the World Food Programme and the UN refugee agency as well as other aid groups such as Save the Children. The Guardian understands this meeting never took place. A media representative for the office of the resident coordinator in Myanmar said a briefing meeting on the initial findings, open to all UN agencies, took place in April. “The UN agreed with the document’s outline of some of the challenges of providing peace, humanitarian and development assistance in Rakhine state, and the risk of further outbreaks of violence. “In fact, the UN in Myanmar was already putting in place some of the changes suggested in the document prior to its release,” said the representative, adding that this included the “crucial” human rights up front mechanism. The final report was “shared with some senior officials”, said the representative, who declined to identify the individuals concerned. Sources in Myanmar said the report was “mentioned at meetings on two occasions” before it “disappeared off the agenda”. No one was able to access the document subsequently. A senior aid official said the final report was “kept very low-key”. “Criticisms, constructive ones, are rarely taken as learning opportunities but are received as personal attacks and provoke defensive responses,” the source added. Meanwhile, Lok-Dessallien faces fresh charges that she undermined attempts to publicly promote the rights of the Rohingya, the stateless Muslim minority. Aid workers said the UN prioritised good relations with the Myanmar government over humanitarian and human rights advocacy. The Guardian approached Horsey, the author of the report, for comment. “The UN knew, or should have known, that the status quo in Rakhine was likely to evolve into a major crisis,” he said in an emailed response. However, he added that the severity of the criticism directed at Lok-Dessallien was unwarranted. “It may be true that the resident coordinator could have done some things differently or better, [but] primary responsibility for any UN failings lies with its headquarters over the last several years,” wrote Horsey. His report said senior UN figures in New York had sent “mixed messages” and there was no replacement special adviser to the secretary general, a high-level UN official with “diplomatic clout”, leaving the resident coordinator in an impossible position. The study cited a “widely-held perception” that there had been “trade-offs between advocacy and access that have in practice de-prioritised human rights and humanitarian action, which are seen as complicating and undermining relations with government”. Phil Robertson, deputy Asia director at Human Rights Watch, said: “It’s not been human rights up front, it’s been human rights down in back.